Throughout March, the University joined millions across the nation celebrating Women’s History Month. At JU, those events centered around meaningful discussion, service opportunities, and thoughtful moments. 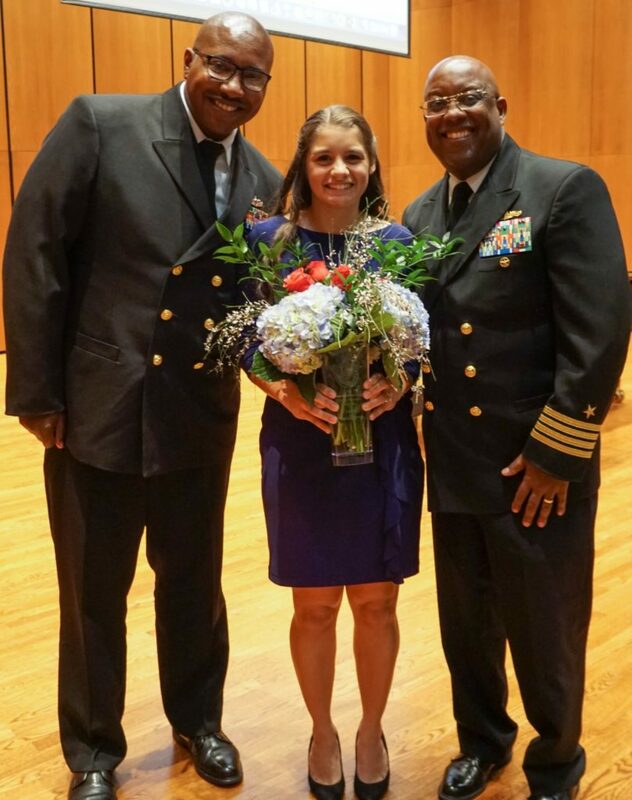 The month-long emphasis culminated with the March 27 celebration and awards ceremony. 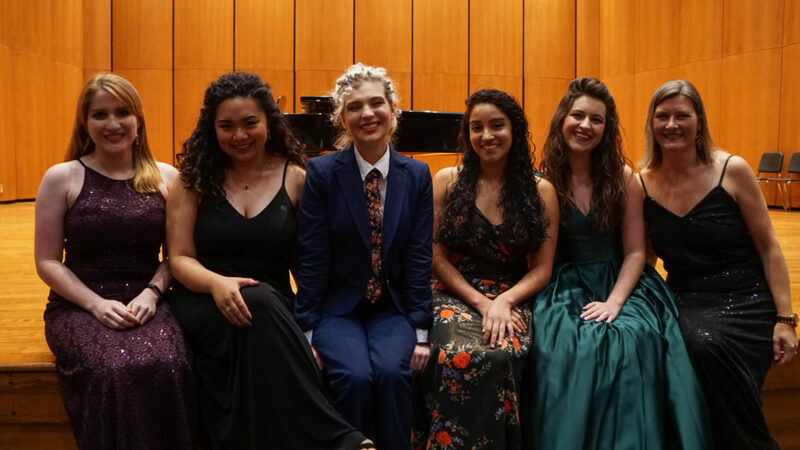 Thirty-five nominees,* including faculty, staff, graduate and undergraduate students, convened at Terry Concert Hall. Each one a participant in JU’s signature women’s initiative—LeadHERship. President Cost addresses nominees at a LeadHERship pre-event reception. Dr. Kristie Gover, Senior Vice President of Student Affairs, and Dr. Kim Beasley, Director of Vocal Studies at the Linda Berry Stein College of Fine Arts (LBSCFA), emceed. 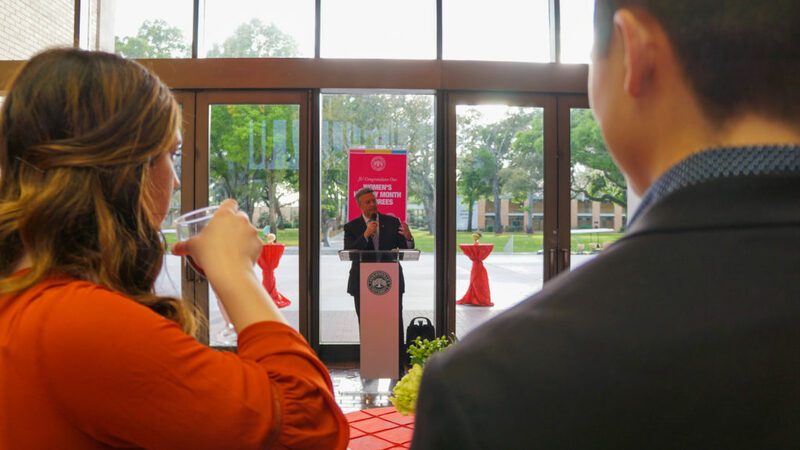 Nominees from the University’s faculty and staff shared several key attributes. A passion for JU, proven leadership ability, and a dynamic connection to students. 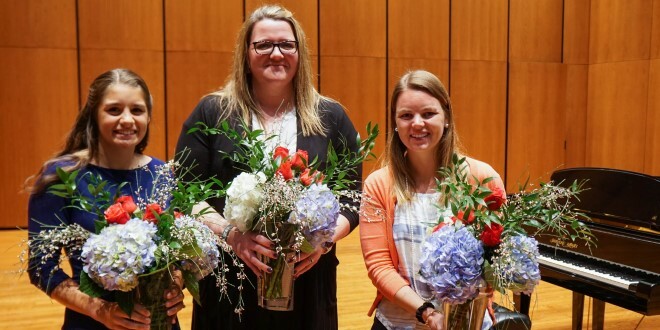 “I can honestly say the many accomplishments of these women made the selection of this year’s Student Woman of the Year a difficult decision,” said Gover. The annual award, named for Dr. Frances Bartlett Kinne, beloved Chancellor Emerita of the University, is endowed with a $500 scholarship. Between the much-anticipated announcements, LBSCFA students graced the stage. Four segments of musical expression began with classical works by Frederick Delius and Amy Beach. The talent of Charly Anne Roper, Angie Acedera, and Carly Mosely set the tone for an evening of reflection. “Amy Beach is a remarkable woman in the history of music,” Beasley told the audience. She was born into a musical family and was composing simple waltzes at age four. Three years later, her piano studies led to public performances of Handel, Beethoven, and Chopin. When she married, her husband requested that she focus on composing, a rarity for a woman at the turn of the twentieth century. Also a founder of the Society of American Women Composers, her pioneering has inspired generations of composers, Beasley said. When Melissa Allen and Erin Seaton stepped into the spotlight, they performed pieces from Fun Home and Princess Diaries II. Empowerment, the theme of the third segment, featured powerful performances by Jade Perry and Emily Pate. They brought to life scenes from Once on This Island and 9 to 5. The ever-popular Joni Mitchell hit, Big Yellow Taxi, followed Fontes-Feraz’ award acceptance, with Charly Anne Roper on vocals and guitar. Originally from Mitchell’s 1970 album Ladies of the Canyon, the song appears in the discography of hundreds of artists. From Canada to Australia and everywhere between, Bob Dylan, Amy Grant, and Counting Crows among them. For more details about JU’s Women’s History Month committee and efforts, contact Caroline Busker at cbusker@ju.edu.